Look your best ! Who said love is blind ?! You know Kiyomizu Autumn Treasure Hunting?! Well! The hunt has begun September 14th and ends on October 6th. Find the little black ninja kitty in select stores in the sim and some in the main stores and get a free gift! This outfit is one of the gifts of the hunt! Is not great?! This dress, gift of Fashion Fears, is really well done ... If you go in the shop you will find two other outfits very very cute! The bag is a gift of PURE for the 300 members in the group! Enjoy it! Today we have an outfit for men and one for women, as you can see ! Good evening guys! 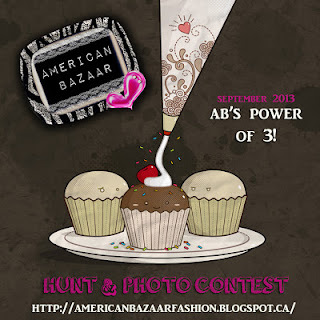 today we talk about "AB's Power of 3 Hunt! (ABPO3)"
There is a FREE HUNT on the AMERICAN BAZAAR sim with over 30 Designers that put out an item! Hurry because the hunt ends September 21! "My home is anywhere you can park!" Sneakers: even.flow - ESH Past Prize: Spiked Sneakers "Pacific Blue"
For "Pearls" who love the glam & chic at the same time! Today I propose a female outfit a bit special =) I hope you like it! Hair: Alice Project - Heather - Autumn Naturals only 25L Fat Pack at Free* Style ! Questo è un badge Flickr che mostra le foto pubbliche e/o i video di Pimkie Kimono. Crea il tuo badge qui.